These cookies are easy to make and quick to prepare! 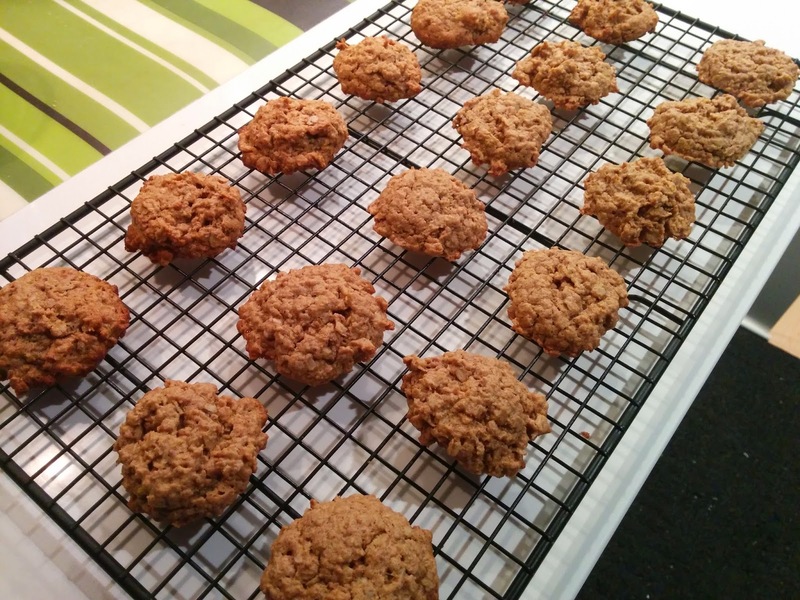 They were similar to my Oatmeal Peanut Butter Coconut Cookies, but I liked the consistency of these cookies better, because they were chewier. I used Kraft smooth peanut butter, so I'm not sure how they'd turn out if you were to use natural peanut butter, but I will have to try it sometime! If you are making a gluten free version of this recipe, be sure to purchase oats labelled "Gluten Free," as regular oats may have cross-contamination. I used my tablespoon measuring spoon to scoop the cookie dough onto the pan to make them uniform in size and shape. That made 19 cookies...so 18, since you have to taste one when it comes out of the oven! In a mixing bowl, combine peanut butter, brown sugar, cinnamon and coconut oil and mix well with a fork. Add the egg and mix to combine. Add oats and baking soda and mix until uniform. Using a spoon, scoop cookie dough onto pans two inches apart. Bake for 8-10 minutes. Transfer to cooling rack.